I often get met with a bit of attitude. "Hey lady, zctly whatchoo think yur lookin at?" As we drive, we try to count how many calves we have thus far. That always becomes interesting, because, you see, calves and cows are living creatures, and... they move. Try as I may, I can NOT get the cows and calves trained to line up for attendance. Nope, just ain't happenin'. "Can't see you! Can't see you! If I can't see you - you can't see me!" "OK Lady, I'm standin, but I ain't linin' up!" 90 calves by the end of calving season. These, are the bulls. They are in a pasture by our house right now. 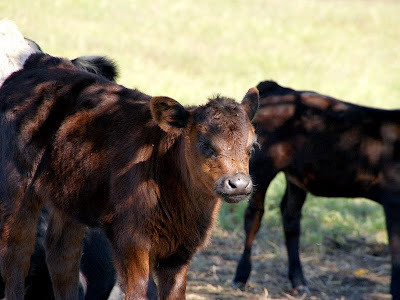 Great shots of the calves, they are so cute. Cool shot of the cows and the moon. Thanks for hosting and for sharing your critters. The calf is so sweet! Love that last shot, too. Wow, thats a lot of calves to keep track of! Nice looking animals to. My dad has a small herd of over two dozen on our family farm and he counts the herd at least a couple of times each day but then he really isn't a farmer any more. Now that he is 82 his cattle are just big pets. 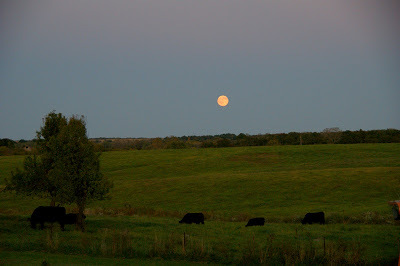 Cute photos of the calves, and a lovely one of the moon over the pasture. 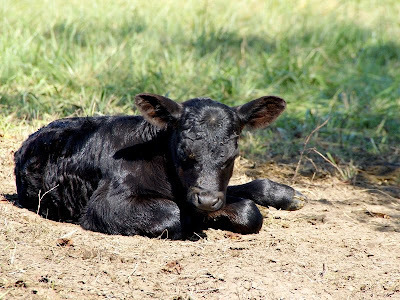 We don't have cows, but we live in a rural area and I love watching the calves play when they're very young. I LOVE the look on the face of the calf! Great shots! Nice shot of the bulls at moonrise. I just love that last shot - beautiful! That's a lot of calves! Those baby cows are very cute! they are cute little calves aren't they. I always thought calving season was more of a spring thing. Great shots! I loved the commentary too! Nope, animals just won't do what they're told, will they?! They are so sweet! Makes you just want to hug them. I'm sure they'd appreciate that. Great story to go with the photos. I love going to the farm I think that is where real fun happens. They are very cute, it must be so nice seeing so many young calves around. This is a wonderful blog, my first visit and I'll be back..the photos are priceless..
Lovely! Young animals are such innocent creatures! Lovely calves ... and moon lit evening too. Excellent subjects, and a very familiar sight. My dad has a lot of cows on the family farm, too. 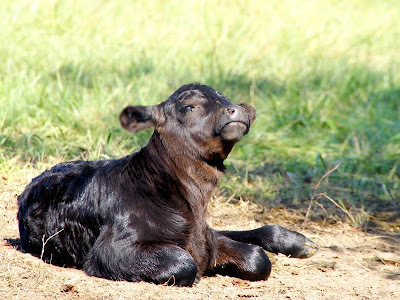 Calves are just too cute! Nice captures! Oh I just love the babies! Adorable! Those calves are very cute. Our neighbors used to have longhorn cattle and I miss seeing the colorful cattle and the calves racing around together.